Microsoft is ready to launch the new Surface Pro, with the date set on February 9. The Surface Pro will be the true hybrid between the PC and tablet, with a lot of PC specs in a tablet design form. 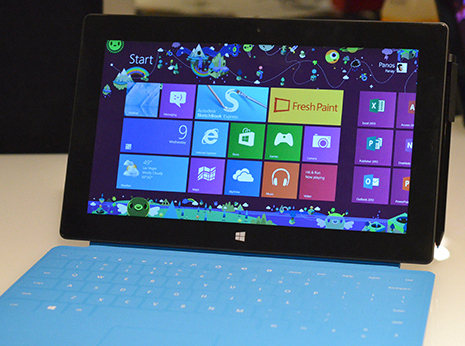 Surface Pro will have the full Windows 8 Pro operating system installed at launch. This is a lot larger and has stocks more features than the Windows RT, which Surface RT is running. With this heavier amount of features there comes a catch, a rather big one too if you were thinking about getting the 64GB version of the Surface Pro. Unfortunately, full Windows 8 Pro will leave you with a pitfall 23GB of storage. Almost 65% of the internal storage is used up by the operating system on the 64GB version. Microsoft has had problems with their operating system storage in the past, with Windows phone and Windows RT. With the 128GB model, you get 85GB of free storage after Windows 8 Pro is preloaded onto the operating system. Better than most tablets, but less than what is expected from a modern day laptop. Microsoft is trying to sell the idea of hybrid. Tablet form in design and display, and PC form in performance and operating system. They still have a long way to go if their OS takes up almost half of the storage. The Surface Pro is compatible with USB 3.0 and includes a microSD card slot for expandable memory, although this may be another annoyance the user has to pursue. Office 365 and other applications are cloud based and you do get 20 free GB of Skydrive cloud storage. There are solutions to this problem, but this still doesn’t make Microsoft look any better.